Nubia today Nubia is a loosely defined region of southern Egypt and northern Sudan which used to stretch more or less 800 kilometers from Aswan to the Forth Cataract on the Nile in Sudan but now extends from south of Luxor to Khartoum, Sudan. In Pharonic times, Nubia was known as the ancient kingdom of Kush. Beginning in the Middle Kingdom the ancient Egyptians obtained gold from Nubia. 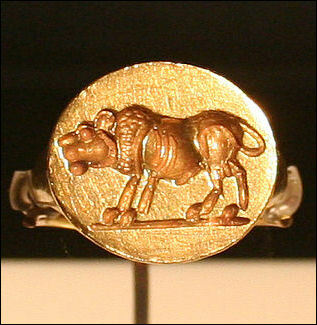 Gold was called nub in ancient Egypt and may be the source of the name Nubia. Ebony, ivory, leopard skins and incenses also came from Nubia or at least were transported through it from sub-Saharan Africa. Mainly what defines Nubia today are the Nubian people, a black race with a history as old as ancient Egypt. The Nubians have their own language, and most of them make a living farming or fishing on the Nile. Others work as captains and crew members on feluccas. 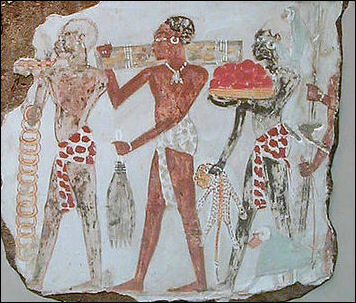 In ancient tomb paintings and reliefs they were often depicted as traders and merchants. Generally, Nubians found in Sudan, especially those who live in the desert, are darker skinned than their Egyptian cousins who have intermarried with Arabs. Nubia pyramids Scholars divide Nubian history into six distinct cultures between 3800 B.C. and A.D. 600. It was a rival of ancient Egypt and lasted considerably longer than ancient Greece or the Roman Empire. Nubia was known as Ta-Seti ("Land of the Bow"), Yam or Wawat to the Egyptians, and Aethiopia to the Greeks and Romans (Ethiopia was called Abyssinia). Nubian civilization was located along a 1,000-mile stretch of the Nile in the middle of the one of driest and hottest parts of the world. In much of Nubia rain never falls. There is much less fertile land than in Egypt and the cataracts (canyons with big rapids) on the Nile make navigation for long stretches impossible. As was true with the “Lower” and “Upper” designations of ancient Egypt “Lower” referred to the northern kingdom of Nubia and “Upper” refers to southern kingdom with the Nile being the point of reference. “Lower Nubia” lies on the northern, down-river part of the Nile roughly between Aswan and the Third Cataract of the Nile and “Upper Nubia” lies on the southern upper river part of the Nile roughly between Third Cataract of the Nile and present-day Khartoum. 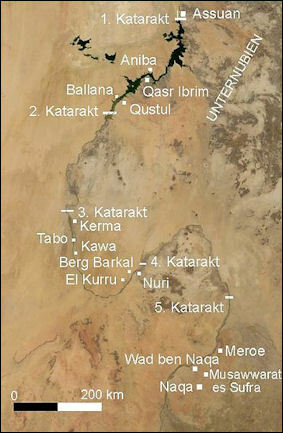 Nubia was centered around the city-states of Napata, El Kurru and Jebel Barkal, near the Forth Cataract of the Nile. Other important cities included Aswan at the First Cataract, Karanog and Quustul north of the Second Cataract, Kerma at the Third Cataract, and Meroe and Naga near the Sixth Cataract. (Khartoum is located further south where the White Nile and Blue Nile join to form the Nile. One of the reasons why Nubia was given a short shrift in ancient history is partly out prejudice towards its largely black population. A Nubian queen once wrote Alexander the Great, "Do not despise us for the color of our skin. In our souls were are brighter than the whitest of people." Most of what has been written about the Nubians originated from its enemies: the Egyptians first and foremost but also from Hebrews, Greeks, Romans and Persians. When Nubian achievements were recognized the credit was often is given ot the Egyptians not the Nubians. Even famed early-20th-century Harvard Egyptologist George Resiner---who offered the first archeological evidence that Nubians ruled over ancient Egypt---qualified his own observations by insisting that black Africans could not possibly have constructed monuments as grand as the ones he found in Nubia. He believed Nubian leaders were light-skinned Egypto-Libyans who ruled over primitive Africans. Taharqa queen The first archaeologists to make significant Nubian finds did so below the Forth Cataract at the royal cemeteries of El Kurru. The concluded that what they found could not have come from black Nubians but must have by white-skinned Libyans. For decades everything found in Nubian was either categorized as "decadent" and "peripheral" or as derived from Egypt. While ancient Egypt has been the focus of much and attention and research, ancient Nubia has largely been ignored. Only in the last 40 years or so has it been the subject of any kind of study at all. Nubian archaeology was greatly set back by the construction of the Aswan dam in the 1960s. The presence of an Islamic government and civil war and the submergence of sites by Lake Nasser has made it difficult for archaeologists to work in Sudan. In recent years serious archeological research has been disrupted by the construction of a dam in Sudan, 1000 kilometers upstream from the Aswan High Dam. The huge Merowe Dan was completed in 2009. Afro-Americans have embraced the Nubians as a kind of chosen people for them. A rap group on New York calls itself Brand Nubian and a Nubian hero "Heru: Son of Ausur" is featured in a new comic book. Nubia was periodically occupied by Egypt beginning in the 3rd millennium. It conquered Egypt in 730 B.C. and ruled it for 60 years (from 750-661 B.C. ), and survived as an Egyptianized kingdom (Kush: capital Meroe) for 100 years. Nubia was a major source of gold, labor and exotic materials for ancient Egypt. The Egyptians were using gold as early as 2000 B.C. The Egyptian often referred to the Nubians as "vile," "miserable" and "wretched." Pharaohs made images of Nubians on their foot stool so they could crush them with their sandals. Fortresses were built to hold off the Nubians. The pharaoh Sneferu recorded a great victory against the Nubians in 2600 B.C. and he bragged 7,000 Nubians and 200,000 domestic animals were captured. Pepi I and Tuthmosis III conquered the Nubians. The first Nubian culture, unglamourously dubbed the A-Group by Harvard archaeologist George Reiner in the 1920s, emerged around 3800 B.C. Little is known about it other than it was a rival of pre-Dynastic Egypt and it produced lovely "eggshell" pottery (named after its thins walls) with red and white geometric patterns that resemble weaving. Around 2800 B.C., reference to the A-Group appear in Egyptian hieroglyphics. Aggressions by Egypt in the third millennium forced the A-Group into a remote area above the Second Cataract. Around 2300 B.C. a pair of new cultures sprang up. One of them, centered in lower Nubia and known as the C-Group, produced elaborate tombs, raised cattle, worshiped gods in a cattle cult and flourished during a 400-year-long period of peace with the Egyptians. Around 1900 B.C. Egyptian armies built a colossal series of fortresses around the Second Cataract and used them to thrust deep into Nubia, perhaps as part of an effort to get a hold of Nubia's gold mines that were being opened at that time in the Eastern Desert. Around 1700 B.C., Egypt was racked by internal problems and withdrew from the fortresses. Kerma Archeologist have unearthed large stone statues of Nubian pharaohs and found dense urban centers and evidence of trade in gold, ebony and ivory, Charles Bonnet, an archeologist who excavated sites in the Second Cataract area, told National Geographic, “It was a kingdom completely free of Egypt and original with its own construction and burial customs. Kerma emerged around 1785 B.C. as Egypt’s Middle Kingdom was declining. By 1500 B.C. the Nubian empire stretched between the Second and Fifth Cataracts. Hints of greatness from this period have een found. Nubian Queen Kawait, for example, is hewn on her sarcophagus with her hair dressed by a noble woman believed to have been sent from Nubia to make a diplomatic marriage with the 11th-dynasty Egyptian pharaoh Mentuhotpe. After the Egyptians left, a grand kingdom emerged at Kerma with palaces, cemeteries and magnificent royal tombs. One king was buried in a football-field-size tumuluses with 400 concubines and a chamber occupied by gold-covered bust and gold, bronze and ivory treasures). In 1550 B.C., Nubia was invaded again by Egypt. The conflicted last about 100 years and when it was over Egypt claimed much of Nubia and controlled it for 350 years, during which time Nubia became throughly Egyptianized as is reflected by Nubian art of that time. The Egyptian Pharaohs could be quite cruel. Thutmose I once sailed into Thebes with the naked body of a rebellious Nubian chieftain dangling from the prow of his ship. Many Nubians captured in the fighting were conscripted into the Egyptian army. The Egyptians built garrisons along the Nile and installed Nubia chiefs as administrator. The children of favored Nubians were educated in Thebes. The Nubians became highly assimilated. They venerated Egyptian gods, particularly Amun, used the Egyptians language, adopted Egyptians burial styles and later even built pyramids. Nubians embraced Egyptian culture and arguably the first to be consumed by Egyptomania. Timothy Kednall if Northeastern University told National Geographic, the Nubians “had become more catholic than the pope.” Today Sudan has more pyramids than Egypt. Around 1080 B.C. internal problems racked Egypt again and Nubia won it autonomy. Little is known about what happened in Nubia until around 850 B.C. Prince Arikankharer Slaying His Enemies In the eighth century B.C., the new powerful kingdom of Napata emerged just below the Forth Cataract. A nearby holy mountain was believed to be the home of the ram-headed supreme god of Amun and an oracle that attracted people from all over Africa and the Middle Eats was established there. At this time Egypt was weak. Around 750 B.C., Napatan kings began expanding their territory northwards. Around 730 B.C., a great army under a king named Piye conquered all of Egypt and Nubia reached from present-day Khartoum to present-day Alexandra. Piye wrote, “I shall let Lower Egypt taste the taste of my fingers.” After capturing one city after another along the Nile in 730 B.C., the army of King Piye stormed the great walled capital of Memphis with flaming arrows. When the city was taken Piye did an extraordinary thing he packed up his army and booty and returned to Nubia never to set foot in Egypt again, as if the whole military campaign was simply to make some kind of point; namely that he was more Egyptian than the Egyptians themselves, which by that time had grown weak and corrupt. Egyptians described Nubians as experts with bow and arrow and Nubia itself was sometimes called Ta-Seti ("Land of the Bow"). Although Egyptian stelae refer to to Nubian leaders as "raging panthers" who attacked their enemies "like a cloudburst," they were regarded by historians as benevolent horse people who patronized the arts and were buried with their chariots. Piye reported that he chose the horses from a conquered lands rather than its women. He was buried with four of his favorite horses. In 701 B.C. , the Nubians battled the Assyrians in Eltekeh in present-day Israel and prevented the Assyrians from taking over Egypt. After the Assyrians moved on Jerusalem, where according to the Bible they looked assured of victory but, as if by miracle, suddenly retreated. Some historian have suggested they fled because they heard the Nubians were advancing towards Jerusalem. The historian Henry Aubin has argued this was a key moment in history, allowing Judaism to strengthen enough to survive the attempt by Babylonian king Nebuchadnezzar to annihilate them, paving the way for Judaism to survive and Christian and Islam to develop. The Nubian dominance was short-lived. By 667 B.C. the Nubians had moved out of Egypt and were replaced by the war-loving Assyrians, whose leaders boasted "I tore up the root of Kush and not one therein escaped to submit to me." Piye modeled himself after powerful pharaohs such as Ramses II, and claimed to be th rightful heir of Egypt. Naming himself Thutmose III, after a famous, Egyptians pharaoh, he had his soldiers purify themselves by bathing in the Nile before battle, dress in fine lines and sprinkle their bodies with water from the temple of Karnak, a site regarded as the dwelling place of the Egyptian god Amun, which Piye had selected as his own personal; deity. When Piye died in 715 B.C. and his 35-year reign ended he was buried in an Egyptian-style pyramid. Piye was succeeded by his brother Shabaka, who embraced Egyptians ways as vigorously as Piye. He adopted the name Pepi, the name of a famous Egyptians Old Kingdom pharaoh and took up residence in the Egyptian capital of Memphis. He made grand additions to the temple in Thebes, erecting a pink granite statute of himself with a Kushite crown at Karnak, one of ancient Egypt’s most sacred sites. Sphinx of Taharqa Nubian queens were thought to have great power. Because kings often married their sisters, some scholars say that power descended through the female line. Great treasures have been found in the tomb of an unidentified queen of the Napatan king Piye, who had at least five wives. 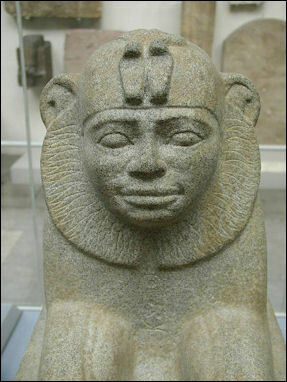 Piye’s son Taharqa succeeded Shabaka and ruled Egypt-Nubia for 26 years. Nubian Egypt reached its pinnacle under his rule. He built monuments with images and cartouches all over Egypt and Nubia and presided over huge harvests helped by record rains and the swelling of the Nile. At Jebel Barkal, Taharqa created a temple dedicated to the goddess Mut, the consort of Amun. He also added an entrance to the Great Temple of Amun at Karnak. Perhaps the most telling evidence of his influence was an eradication campaign that was launched to wipe out all images of him in Egypt after his death. Taharqa needed lots f cedar and juniper from Lebanon to realize his building campaign. When the Assyrian ruler King Esarhaddon tried to shut down the trade, Taharqa sent troops to the southern Levant to support a revolt against the Assyrians. Esarhaddon stopped the effort and launched an attack into Egypt which Taharqa’s army pushed back in 674 B.C. The Assyrians later wrote: “His queen, his harem, Ushankhuru his heir, and the rets of his ons and daughters, his property and his goods, his horses, his cattle, his sheep, in countless numbers I carried off to Assyria. The root of Kush I tore up out of Egypt.” To commemorate the event a stelae was raised that showed Taharqa’s son Ushankhuru, kneeling before the Assyrian king with a rope around his neck. In 669 B.C. Esarhaddon died on route to Egypt but his successor quickly mounted a n assault on Egypt. Taharqa knew he was outnumbered this time and fled to Napata never to return to Egypt again. How Taharqa spent his final years is unknown but he was allowed ti remain in power in Nubia. Like his father Piye he was buried in a pyramid. Gradually the center of the Nubian kingdom shifted further south to below the Forth Cataract. 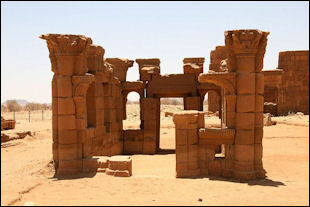 Meroe flourished from 270 B.C. to A.D. 350. The Nubians there produced distinctive art and built cities around artificial reservoirs. Efforts by the Persians and Romans to conquer them were unsuccessful. Through their isolation, the Meriotes lost the use of Egyptian hieroglyphics and developed a quasi-cursive script alphabet now called Meroitic. Thus far 23 letters have been figured out using small fragments of Rossetta-stone-like tablets but the language remains largely undeciphered. It s unrelated languages used by modern Nubians and is unlike an other known languages. The Nubians thrived until the king of Aksum destroyed Meroë, their capital around A.D. 350. 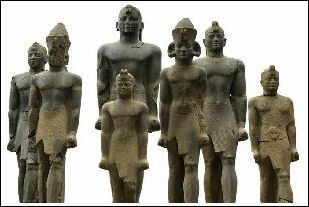 After that Nubian links to Pharaonic Egypt disappeared. Nubia was Christianized in the A.D. 6th century and virtually vanished from the European historical record until the 19th century. Nubians in Kerma lived in circular thatch-roof huts made from wood. The dwellings were oriented towards the north wind, which provides relief in the summer. In the winter temporary walls were set up to block the wind. Kerma was surrounded by a defensive palisade. Nubians at Kerma raised crops, chiefly wheat and barely, in fields and gardens and raised cattle and goats. Herodotus said the were able to live long lives because they consumed a lot of boiled meat and milk. Nubians liked to drink. Archaeologists have unearthed large barrooms and pots for drinking wine. The Nubians were excellent horsemen and cattle raisers. They built a large smelting operation in ore-rich region around Merowe. Nubian religious images included falcons represented gods and depictions of bound prisoners have their heads dashed open in front of images of gods. Tawaret figurine Among the 3,000 items on display at the Nubian Museum in Aswan are tomb paintings, bas-reliefs, a black stone head of a pharaoh, rock drawings of wolves, life-size models of mud homes, water wheels and stone tombs. Many of the ancient objects were rescued before the completion of the Aswan High Dam. A cylindrical burner circled by a frieze of incised figured has been dated to 3300 B.C. 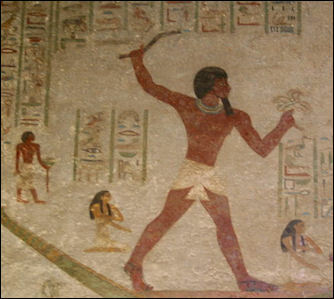 Ancient Nubian painting resembles Egyptian painting but that does not mean all of their art was derivative. Meroitic art was especially idiosyncratic and full of playfulness.Emily Teeter of the Oriental Institute told Smithsonian, "It became a very spontaneous art, full of free-flowing improvisation." Nubian craftsmen made wonderful pieces of gold jewelry with semiprecious stones. 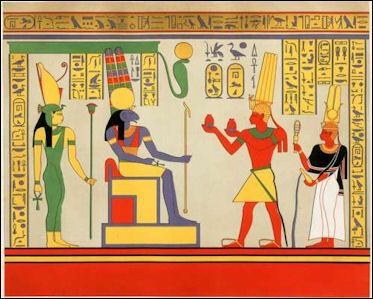 They also produced cream-colored pots decorated with ankh-carrying cobras; ram-head sphinxes on columns with colored glass inlays, fired clay sculptures of hippopotamuses, antelope-shaped calcite jars, bronze bed legs with a goose-shaped pedestals, glass and glod pendants with the head of the goddess Hathor, gold pectorals with a winged goddesses, pots with two-legged crocodiles, giraffes and abstract waves and curlicues, golden rams heads and balls a pitcher shaped like a hippopotamus whose mouth serves as a spout (1700-1550 B.C.). One of Reisner’s excavations turned up pieces of large-scale architectural faience, including a rosette-patterned ceiling block and a wall inlay of a lion, which are both on view. They are thought to have decorated the funeral beds of the kings of Kerma (the capital of Kush). Faience is a blue-green paste made from crushed quartz or sand and often substituted for the more precious turquoise or lapis lazuli. Though an Egyptian invention, faience became an important status symbol for the Nubian elite and was locally produced. Many of the remains from the period from Egypt’s conquest of Nubia through the reign of the Napatan dynasty (the Nubian kings who ruled Egypt) are many more funerary objects that are hard to distinguish from Egyptians ones. The tomb of the Napatan king Senkamanisken contained more than a thousand shawabtis, slaves of the afterlife. A large statue of Senkamanisken, who ruled from 640 to 620 B.C. 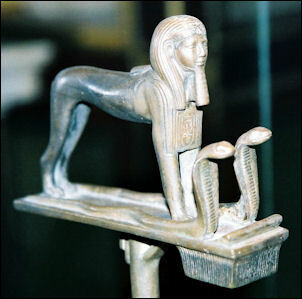 Has one-foot-forward pose and serpent crown that looks very Egyptian, though there are subtle differences; the crown has two serpents, as opposed to the one favored by the Egyptian pharaohs. 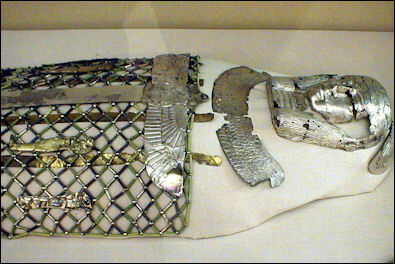 There are objects recovered from the pyramids of other Nubian kings. But the real buried treasure in this show is the story of the Nubian queens; A delicate crystal pendant showing the Egyptian goddess Hathor with a cow’s horns is one of the show’s most extraordinary objects. It was found in the tomb of an unidentified queen of the Napatan king Piye. There are more pyramids in Sudan than in Egypt. Even so not much is left. The Nubians primarily built the structures from mud brick. The Temple of Kalabasha (on an island in Lake Nasser near the Aswan High Dam) was moved in 1970 from the banks of the Nile 30 miles to a new site near the Aswan High Dam. Dating back to the Roman Emperor Augustus (30 B.C.-14 A.D.), this huge Nubian style sandstone temple is dedicated to the fertility god Mandulis, represented by a human-headed bird. The temple features rectangular staging area used in processional celebrations and a wall covered with texts, inscriptions and depictions of Egyptian deities such as Isis, Osiris and other. Nearby is the Kiosk of Kertassi. Dedicated to Hathor, who is often depicted with the ears of a cow, it features two Hathor-headed columns with grape-arbor motifs, a reference to Hathor's link to drunkenness. It was moved at the same time as Kalabasha and now sits near the water and have fine view of Lake Nasser. Nearby are petroglyphs with images of boats, elephants and giraffes carved into the hillsides. Nubian ruins near Khartoum Wadi al-Seboua al Gerdid (90 miles south of Aswan) is the home of a temple built by Seatau, a viceroy from Nubia, in honor of Ramses II. It features a pylon (gate) in front of a courtyard and colossal images of Ramses II. On the walls of the temples is a list of all of Ramses II children---nearly 100 of them---on the walls. Later Christians used the cliff-cut halls of the temple for chapels, decorating many of them with frescos. The temple is beautifully situated among sand dunes. 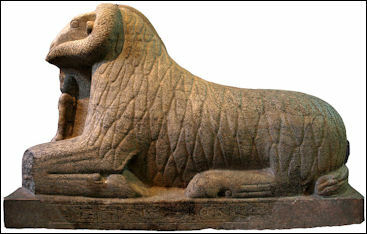 The causeway leading to it features the El Sibû Lions, a half dozen 3,200-year-old, badly-worn sphinxes with big turbans on their heads. El Sibû Lions were relocated to higher ground during the construction of the Aswan Dam. Near Wadi al-Seboua al Gerdid is a temple dedicated to Thoth, which features sanctuaries honoring Nubia, Ptolemaic, Roman and Egyptian rulers with well-preserved reliefs from the Ptolemaic and Roman periods. In the area you can also find traditional Nubian adobe houses, decorated with painted symbols and built with 600 year old construction techniques. Painted villages include Abu Hôr and Qûrta. Exotic materials that originated in Nubia included gold, frankincense, ebony, ivory, panther skins, giraffe tails and hippopotamus teeth. Nubia was also an important link between Egypt and Africa during ancient times. Honey, wheat and cloth flowed south on the Nile from Egypt, and ebony, leopard skins, ivory and pygmies headed north from Africa. Goods were transported by a combination of river boats and caravans that traversed the "short cuts" between the S-shaped loops on the Nile. The ancient Egyptians obtained gold from Nubia beginning in the Middle Kingdom. Gold was called nub in ancient Egypt and is thought to the source of the name Nubia. Punt, a mysterious fabled land south of Egypt, supplied Egypt with myrrh, ebony, ivory, gold, spices, panther skins, live baboons and other exotic animals and frankincense. The exact location of Punt is still unknown. It may have been in modern-day Somalia, Yemen or Oman. Traders crossed the Eastern desert and sailed from the Red Sea to get there. Much of what is known about Punt is based on reliefs found on the wall of the Deir el Bahri temple, built around 1490 B.C. in western Thebes. The reliefs show trade between rulers of Punt and emissaries of Queen Hatshepsut. The inscription at Gebel Sheikh Suleiman...which shows a giant scorpion holding in its pincers a defeated Nubian chieftain, is a graphic illustration of Egyptian policy toward Nubia. A second inscription nearby, dating to the threshold of the First Dynasty, completes the story. It shows a scene of devastation, with Nubians lying dead and dying, watched over by the cipher (hieroglyphic marker) of the Egyptian king. The prosperous city- states of the Near East, which were useful trading partners and geographically separate from Egypt, could be allowed to exist, but a rival kingdom immediately upstream was unthinkable. Following Egypt’s decisive early intervention in lower Nubia, this stretch of the Nile Valley---though it would remain a thorn in Egypt’s side---would not rise again as a serious power for nearly a thousand years. The new research, Dr. Darnell said, “completely explains the rise and importance of Thebes.” From there rulers commanded the shortest route from the Nile west to desert oases and also the shortest eastern road to the Red Sea. Inscriptions from about 2000 B.C. show that a Theban ruler, most likely Mentuhotep II, annexed both the western oasis region and northern Nubia. With further investigations at Umm Mawagir, Dr. Darnell said, scholars may recognize the desert as a kind of fourth power, in addition to the Hyksos, Nubians and Thebans, in the political equation in those uncertain times. It was perhaps their control of desert roads and alliance with vibrant oasis communities that gave the Thebans an edge in the struggle to control Egypt’s future. Text Sources: Internet Ancient History Sourcebook: Mesopotamia sourcebooks.fordham.edu , National Geographic, Smithsonian magazine, especially Merle Severy, National Geographic, May 1991 and Marion Steinmann, Smithsonian, December 1988, New York Times, Washington Post, Los Angeles Times, Discover magazine, Times of London, Natural History magazine, Archaeology magazine, The New Yorker, BBC, Encyclopædia Britannica, Metropolitan Museum of Art, Time, Newsweek, Wikipedia, Reuters, Associated Press, The Guardian, AFP, Lonely Planet Guides, World Religions edited by Geoffrey Parrinder (Facts on File Publications, New York); History of Warfare by John Keegan (Vintage Books); History of Art by H.W. Janson Prentice Hall, Englewood Cliffs, N.J.), Compton’s Encyclopedia and various books and other publications.